This series of KOOLTRONIC Air Conditioners offers the same range of sizes, voltages and frequencies as the TrimLine Series, with cooling capacities of 4,000 to 12,000 BTU/H, in 19" width, including side flanges. These traditional width models have been redesigned to our latest standards and are available in popular heights ranging from 24" to 59", for maximum flexibility in obtaining optimal cooling efficiency. Good design dictates that the warm air return should be as far as possible from the cool air outlet. 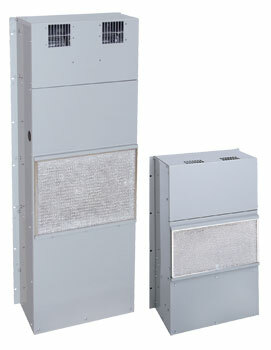 In addition, the air conditioner height should provide for the cooling air to be forced through all the heat-producing components in the enclosure. KOOLTRONIC designs satisfy both of these needs. These high performance air conditioners can be installed in a variety of locations, either fixed or hinged, directly to any vertical cabinet panel or door. Gasketed mountings and the closed-loop design seal out moisture and contaminant-laden ambient air. Powerful Kooltronic-designed centrifugal blowers circulate clean, cool air throughout the enclosure. Outdoor or corrosive environments require weather protection and/or special internal and external protective features. Also see Guardian/GuardianX, Advantage Indoor/Outdoor, Integrity NEMA 4/4X and Intrepid Outdoor Series. For extreme ambient temperatures and/or severely contaminated environments, the use of Water-Cooled Air Conditioners or Water-Cooled Heat Exchangers is recommended. General specifications common to all KOOLTRONIC Air Conditioners are on the first page of this section. All Traditional models are UL/CUL Listed or Recognized. All Recognized models are available as Listed at added cost. All units are fully gasketed for tight, leakproof installation, in compliance with the NEMA 12 Enclosure Ratings.